Over the past decade, local search has entered the spotlight and become a vital component of SEO for businesses. Along the way, search engine algorithms and SEO best practices have undergone a series of facelifts that have affected how local businesses rank in search results. While some of these adjustments were slow, gradual, and barely noticeable at the time, others were sudden and drastic, forcing businesses to rethink their basic SEO strategies and reevaluate how to optimize their online visibility. Sometimes, the best way to prepare for the future is to look back at how far local search has come since its humble beginnings. Since business owners should always be on the lookout for changes in the SEO landscape, let’s review how SEO has evolved in the past 10 years. 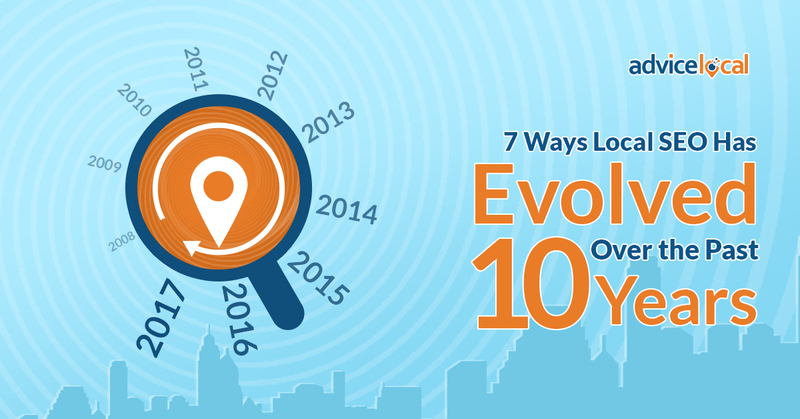 Local SEO gained prominence in 2009 when Google introduced Place Pages for Google Maps. In 2010, Google integrated local search results with organic search results, shaking up the entire local search industry. Around the same time, other search engines also began showing location search results within their maps. There were additional warning signs that businesses needed to start taking local search more seriously – when Google moved from phone verification to postcard verification for business listings in 2010. The way Google displays local search results has also evolved. For instance, Google switched from the local carousel to the local pack in 2014 (although the carousel is still used to display certain non-local results, like movie cast members). Today’s local pack is even more compact than the original. Now, only three local businesses are displayed in Google’s highly coveted local 3-pack, which displays the highest ranking Google My Business listings at the top of the search results page. If we look back even further – to the days when AOL was the most prominent search engine on the market – we can compare Google’s series of local search updates to AOL’s failure to evolve with the times. In hindsight, it’s clear to see that Google’s willingness to innovate is the key to its continued success. The desire to write content that customers want to read contributed to the popularity of content marketing. Today, content marketing can be an integral aspect of a business’ SEO strategy, especially in the context of creating high-quality content that increases brand awareness – which can improve a business’ reputation, visibility, and bottom line. Remember, in 2007 social media wasn’t the widespread phenomenon it is today. Social media and search were considered completely unrelated and Google was not yet indexing content on Facebook or Twitter. Now, local SEO is fully linked to social media. Search engines are paying attention to how brands interact with their fans online. A business’ social profile is also a great place to ask for consumer reviews that can boost visibility, score extra backlinks by sharing quality content, and another place to list accurate NAP data (name, address, phone number). When SEO was a new concept, link building was all about numbers. The more backlinks a business could score, the higher its website ranked in search results. Google didn’t discriminate between high- and low-quality sources, which allowed unscrupulous marketers to get away with all kinds of black hat tactics that would never work today. Modern link building is more concerned with quality than quantity. Collecting a smaller number of high-quality, relevant links will serve a business much better than a high number of links from irrelevant or untrustworthy websites. Can you believe the first-generation iPhone was introduced 10 years ago? In 2007, only early adopters were accessing the internet from their phones. A decade later and everyone and their grandmother turns to their trusty smartphone when they need to look something up. Today, mobile searches outnumber desktop searches. Google is even transitioning to a new mobile-first index. Businesses need their websites to be mobile-friendly, quick to load, and optimized for local search (since many consumers search for nearby stores while on-the-go). Google announced its machine learning algorithm known as RankBrain in 2015. Now that RankBrain is live, Google is getting smarter all the time – which means search results are continuing to get more targeted, local, and customized. The search engine is able to recognize (and reward) high-quality content and is always learning how to identify which websites offer the most benefits to consumers. We all know that keyword stuffing was once a popular SEO tactic – and that’s because back in the day, Google wasn’t as good at reading context. Now, user intent is the name of the game. The search engine is getting better at figuring out what searchers are actually looking for. So, instead of simply returning results with identical keywords, Google can now provide relevant results based on keyword variations and other recent searches. As you can see, a lot has changed in the past decade. With recent technological advancements, we’re seeing search algorithm change and develop more quickly. This exponential growth is both exciting and nerve-wracking for local businesses that want to keep up with the latest SEO best practices. Unfortunately, businesses that don’t adapt to algorithm changes, SEO guidelines, and consumer preferences are risking their reputation and visibility. It’s critical for local businesses to proactively manage their local search presence to keep up with the shifting search landscape. Another option is to leave the business’ SEO strategy in the hands of experienced professionals. Get in touch with our team to find out how our local search experts can help the business you represent.